These are typical infantry officer's embroidered insignia that were worn on the Jeff Davis hat. Many of these have the number of the regiment in the center on the horn in silver. The number could be either embroidered or in metal. Our one example lacks a number, as do some on period photographs. 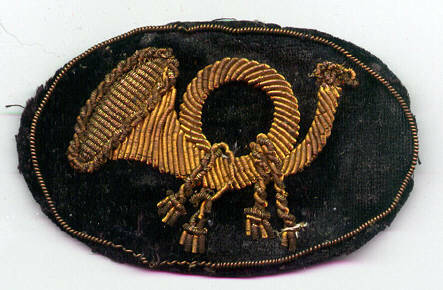 The horn device was borrowed from European armies where it was used as a badge of light infantry. 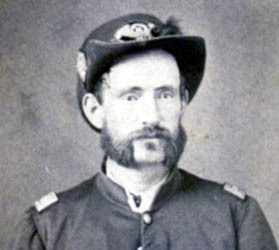 These units were often drawn from experienced huntmen and foresters. The hunting horn came their symbol. In 1875 the U.S. Army replaced the horn with crossed rifles. 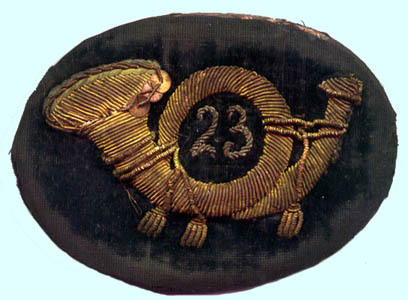 About 80% of the Union Army was infantry and the infantry horn is the most commonly encountered of Civil War hat insignia.